Simplehuman – Simply the Best! Very seldom do I get excited about something and I never endorse products. Any advertisements placed on this blog are put here by WordPress so they can make a few bucks off my work. It’s rather irritating but I agreed to their terms and conditions when I started this blog. This is a food blog so I try to keep it focused on food. With this post, however, I am making the only exception to my unwritten rule. In 2004 I purchased the house in which we now reside. The day after Christmas I was at the day labor lot hiring a group of laborers to start remodeling the house. All of the carpets came out, the cabinets came out, the baseboards came out and a laminate floor came out. Then we began hiring contractors to do various parts of the remodeling. It took over 7 months before the house was completed and I wasn’t living in it during the remodel. I was so relieved when it was done. Now, I had the kitchen I always wanted and only needed to furnish it. Of course, one of the first things you must have for any kitchen is a trashcan. There is probably no more used piece of equipment in the kitchen. So, off to the various stores I went in search of a nice looking, well built trashcan. Because of the amount of stainless steel appliances, I wanted a stainless steel trashcan because it would fit the look of the kitchen. This was going to be a trashcan on display as opposed to under the sink or in the pantry. So, it had to look nice. I also wanted a step can because when you’re cooking you typically have your hands messy or full and you don’t want to touch the trashcan. I looked at a lot of trashcans. Most were poorly made, flimsy stainless steel and I just didn’t like them. 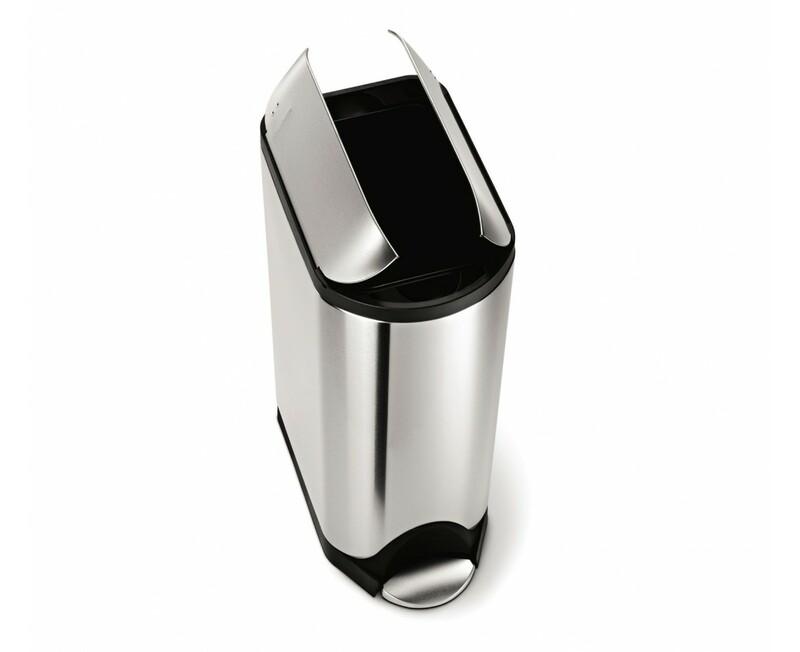 Finally, I found Simplehuman trashcans. They looked and felt sturdy, looked well made, slowly closed so as not to slam the lid and appeared to be well engineered. So, I forked over the $129 (about double the price of the next highest, somewhat comparable, stainless steel trashcan) for a 45 litre butterfly trashcan depicted above. This was in July 2005. In November 2012, after 7 years of constant use, one of the stainless steel lid hinge pins on the trashcan broke. I had long since lost the receipt for the trashcan and never registered it. Nevertheless, I called Simplehuman to see what could be done, if anything. Their customer service was amazing. Without proof of purchase or registration, they sent me the pins, a new damper because the lid was closing a little quicker than it should, some new non-skid foot pads to replace the older ones and instructions to do what needed to be done. All of this was at no charge, including the shipping. I was able to do everything necessary to be done in about 30 minutes. When done, I had essentially a brand new trash can. We were all impressed. Flash forward 1-1/2 years. After 9 years of constant use another part within the trashcan broke. It was a plastic track that was part of the step opener. Once again, I contacted Simplehuman. Sadly, Simplehuman no longer made this particular replacement part. Again, without proof of purchase or registration, Simplehuman sent me a UPS label, paid for the return shipping and delivered to me a BRAND NEW TRASH CAN of the latest model. All it cost us was $9.50 for a box and some packing material to ship the trash can back to Simplehuman. Baby Lady & I were and still are simply amazed. I have had some remarkably good experiences with customer service from Kitchenaid but I have never had an experience that approximates the quality customer service we received from Simplehuman. So, while the price of the trash can is steep, I have yet to pay for a replacement part. Even after 9 years of constant use, the trashcan looked new. Now, I have a new “improved” trashcan that should last me another 9 – 10 years, if not longer. So, if you are ever in the market for a nice, quality trashcan, that won’t be stuck under a cabinet or in the pantry, Baby Lady & I heartily recommend and endorse Simplehuman trashcans. Their product is well engineered and constructed. Equally important, their warranty and customer service are second to none and they stand behind their product. They deserve all of the accolades they receive. Legal Notice: I receive no remuneration of any kind from Simplehuman and they have not asked me to endorse or recommend their product. in fact, they are unaware I am doing this post. This post is simply my experience with their 45 litre step can, their warranty and customer service. I love stories like that. When we moved into our current home 13 years ago we made some minor upgrades to the house one of which was adding an extra hand towel rack to the renovated bathroom. Sadly when I called the high end store the fixtures were purchased from they told me it had been discontinued, but gave me the name of the Italian manufacturer. I contacted them and recounted my story and they confirmed that the particular model had been discontinued for several years but they would check the warehouse anyway. Within a few days they emailed me that they did indeed find one and if I sent them my address they would ship it to me. Cautiously excited I asked what the price was (the store the previous home owner bought it from was very high end) and they said nothing. I didn’t even have to pay for shipping! Really good to know. I own the same brand, although a different model. My husband about died when he found out what I spent, but we’d gone through about one trash can every two years, and it’s now been maybe 8 years with no issues. Good to know about their customer service. But I’m just so happy about the product itself! What is it about trash can people? We have a Brabantia. In the past 17 years, they have replaced the lid section three times and the body once without charge. They have also supplied two sets of clips for the lid. Good people in that business. Wow, actual proper customer service. I didn’t think that existed! It’s hard to imagine this kind of thing happens anymore. Someone should point Amazon in their direction. I too had a trash can – a brabantia as per Conor above – but I couldn’t decide where it should go so I stuck it out the back where it is acting as a spider colony (I think I can’t go near it on account of my arachnophobia. We have a simplehuman trash can and I can only hope that we will get the same service if something happens to it. I’m sure you will receive the same treatment should you ever have a problem. They really are a great company and I love their products.